TEN’s The Great Australian Spelling Bee, now has a start date, premiering Monday August 3rd and continuing on Tuesday August 4th. From over 3,000 eager applicants, 52 kids aged between 8 and 13, made it in. This photo from TEN indicates a big multicultural representation in the show, which is very encouraging. Co-host Chrissie Swan said: “The Great Australian Spelling Bee is edge-of-your-seat entertainment with jaw-dropping moments that will leave viewers utterly amazed. With Spelling Bee looking set to be a Monday / Tuesday offering, that just leaves Sundays for TEN to fill in and it isn’t clear whether Gold Coast Cops / Bondi Rescue are remaining in their respective slots. 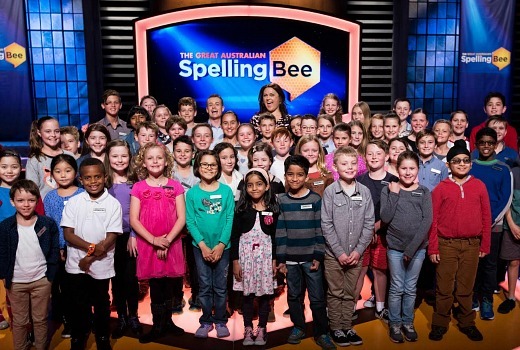 Hosted by Grant Denyer and Chrissie Swan, The Great Australian Spelling Bee is a visual spectacular that requires spellers to display a combination of speed, skill and smarts to deconstruct words. Macquarie Dictionary provided and graded all the words that appear in the program, taking into account multiple factors including neutral vowels, silent letters, double consonants and familiarity. Spellers were given a list of 2,300 words, which could be featured in the program, five days before filming commenced. These words are identified as SEEN words. UNSEEN words from the Macquarie Dictionary will also be used. Hope that many kids spell complicated words correctly! A show I won’t be watching unless they can guarantee each and every eliminated contestant does better financially than the final winner. This is how children should be treated when they are used for commercial purposes on TV no matter what they do or how they cope, they will always get something of greater value out of it than the actual winner. It’s not the winner who makes a show like this, it’s all the others who fall down for our entertainment. Yes most certainly should have stayed on Sunday’s where it was originally advertised. 6:30 Sunday is the ideal timeslot. Too narrow for later. TEN probably thought they had a better audience mid week with The Project ratings but that won’t save it against Hot Plate and Rest Revolution. This is a saturday morning program, not a peak viewing program, just a waste of money and sheer stupidity to put up against stronger titles …. Ten is going back to their old ways of stupid programming ….. next they will bring back the shire and Bingle …..
Would have made more sense to launch this next Tuesday night where they might get a bit of a halo effect from the MasterChef finale, rather than a week later. wouldn’t they already get it with The Bachelor on the Wednesday and Thursday? As a father of a 7 and 9 year old I can quite easily see this being a good family show option – except for the timeslot. Lights are out at 8pm on a school night in our house I’m afraid so no Spelling Bee for us. If that’s the case, you mustn’t watch anything. Most primetime shows finish (or surpost to finish at) 8:30. I guess you can watch on Tenplay at your own time. I will just record it and the wee one can watch it on the weekend! So Ten has decided to put this up against The Voice and Dancing with the stars. And a show featuring contestants aged 8 to 13 are going to have much of its audience in bed between 7.30pm and 9pm on weeknights. Bravo to the highly paid executives who came up with this decision. The obvious time to show this was Sundays 6.30pm. It would have finished around 8pm. The kids would have got a dose of fun education and then gone to bed allowing the adults to watch Modern Family repeats or switch over to watch The Voice or DWTS. I have been wrong before – but I think after the first episode rating about 800k – it will plummet to about 500k on Tuesday night and then be dumped. Sorry kids. I liked the promos and thought it would be a show my 8 year old and I could watch together. But she goes to bed at 8pm on weeknights and its no point letting her watch half a show. That kid next to Chrissie looks very happy to be there. Haha. Didn’t even see him there until you pointed him out. Hasty last minute change to Mon/Tues after they advertised in Brisbane here as ‘Coming soon to Sundays & Mondays’, probably based on whatever 7 & 9 have now scheduled. Will be interesting to see what they do on Sunday’s now.. I would have thought their previous line-up was a better plan with factuals on Tues between reality.